American Ninja Warrior Wolfpack Ninja Ian Dory wants you to get motivated! My name is Ian Dory. I am the youngest member of the Wolfpack–also known as the ‘Wolfpup’–and I am beyond excited to share my drive for studies, fitness and health with everyone. Our goal with the Wolfpack Ninjas Initiative is to combat childhood obesity, empower the next generation of ninjas, and get them on course for a healthier lifestyle. We want them to experience future success as leaders. Our website is a motivational destination for kids and parents to stay up to date on what the Wolfpack is doing. It allows us to show kids how they can develop healthy habits and follow in our Wolf prints. It is filled with great content like tips on nutrition, fitness, and how to succeed in academics not to mention the entertainment factor! Register for our site, print out your Wolf Cub certificate and become an honorary Wolfpack Ninja member today. I have been a climber all of my life; my dad introduced the sport to me as soon as I could crawl. The feeling of being in nature with people who motivate and inspire allows me to embody the confidence to continuously push myself to the next level of fitness, and this translates to other areas of my life like my collegiate studies. This feeling of confidence and determination is indescribable. My own drive combined with the passion of my friends and mentors is what I harness and use to reach my true potential and be the best student, athlete, and person I can be. Seeing your friend’s ambitions to reach new heights is the secret ingredient; it is how and why every member of the Wolfpack Ninjas are able to train harder and smarter. It is why we perform so well under pressure on the amazing American Ninja Warrior courses and in other areas of our lives. This kind of synergistic energy is why the Wolfpack members–Noah Kaufman, Brian Arnold, Meagan Martin and myself–are some of the top Ninjas in the world. The Wolfpack is enthusiastic in our commitment and passion to share this energy with you. Sir Isaac Newton said “If I have seen further, it is by standing on the shoulders of giants.” We use the power of the Wolfpack Ninjas to sharpen our bodies and our minds so when it’s time to compete we know we are ready. This quality of energy is what we want to spread to our children; to inspire the future and make this country even better. We want people to find their own Wolfpack. By being a part of our Wolfpack–and taking the lessons we share and growing with them–our children, our future can spread health and wellness throughout the world. They will be our leaders and the greats of their generation. The people you surround yourself with will inevitably help define you. Surround yourself with people that will inspire, motivate and push you to your next level. Rock climbing has been hands down the best ninja training. It is the perfect combination of fitness and mental focus. However, to be a well-rounded Ninja, you also must incorporate parkour, hiking, running, biking, yoga, swimming, and mind training into your regimens. 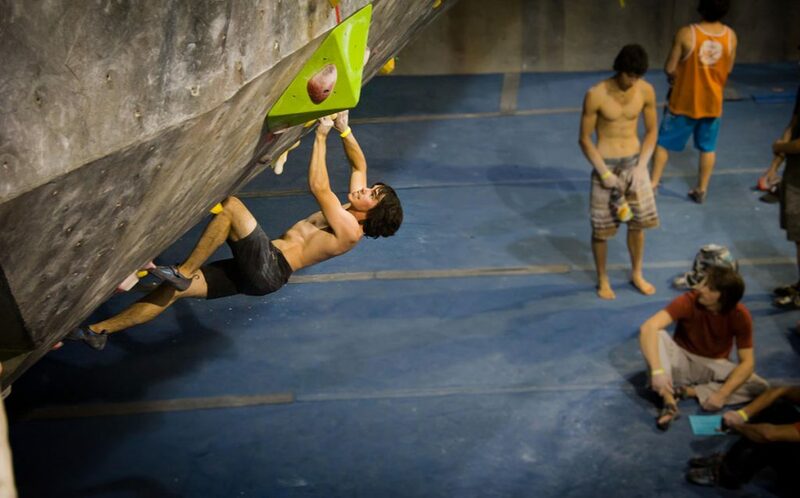 The Wolfpack uses rock climbing as a foundation for our training, and this is our passion. We love getting a great workout while doing something we absolutely love. The Wolfpack Ninja family uses indoor and outdoor climbing to train cardio, coordination, finger strength and forearm strength. Rock climbing helps with obstacles like the Salmon Ladder, the Ultimate Cliff Hanger, and the Flying Bars. Parkour is a skill that we use for agility, explosive power, dynamic moves, balance and foot-eye coordination. These lower body skill sets are imperative for conquering obstacles like the Quintuple Steps, the Spinning Log and the Roulette Wheel. Swimming, running, and biking are the fillers that the Wolfpack uses to achieve the necessary cardio fitness in order to string all the obstacles together. If you want to be a Wolf, you need to acquire these types of skills and strive for a balance in fitness, academics and family. No one thing can be neglected without repercussions to the next. The best ninjas in the world have found a way to balance all of these things and you can too. It takes hard work and diligence, and the effort you put into improving yourself is the best investment you will ever make. Strive for excellence. Join us Wolfpack Ninjas and together let’s change the world.